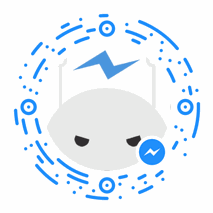 We need some special permissions to be able to retrieve the Facebook Messenger Codes. In particular, we will ask for your permission to manage your pages and send messages on their behalf but we promise not to do any changes or send any messages. We print your Messenger Code in vivid color and razor-sharp detail. Stickers are 5.8 x 5.8 cm, with slightly rounded corners. Your stickers will be at your door in no time. Orders ship from Berlin in one business day. See delivery times here. One product, one price – no hidden fees. 36 stickers for 12€, 60 for 18€ and 108 for 28€ – always including shipping worldwide.